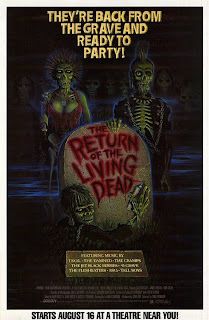 Tag line: "They're Back From The Grave and Ready To Party!" 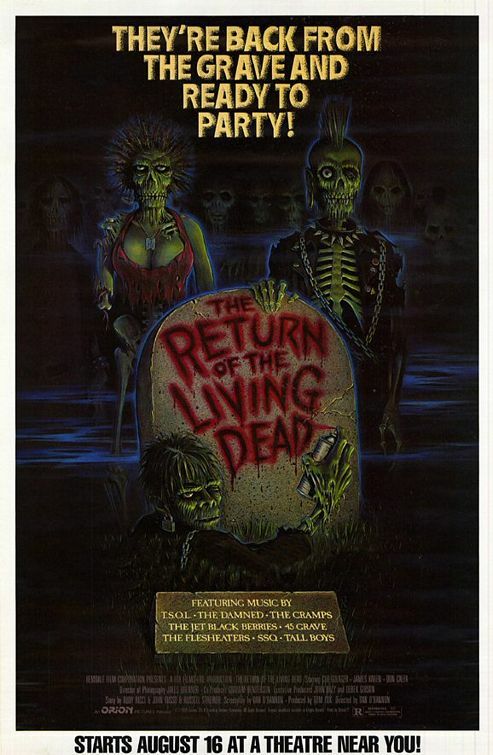 Most zom-coms (which is short for “zombie comedies”), including recent entries like Shaun of the Dead and Zombieland, owe a little something to Dan O’Bannon’s 1985 directorial debut, Return of the Living Dead, one of the first films to introduce comedy into the world of the Romero-style walking dead. The result is a movie that, while short on scares, will definitely give you plenty to laugh about. Freddy (Thom Mathews) and Frank (James Karen), two hapless employees working at a medical supply warehouse, inadvertently release a lethal gas that resurrects the dead and transforms them into bloodthirsty monsters. With the help of their boss, Burt (Clu Galager), as well as Ernie (Don Calfa), who runs the morgue next door, Freddy and Frank do what they can to “clean up” their mistake before anyone finds out about it. But when the gas infects the air, then spreads by way of a rainstorm to the nearby cemetery, it awakens hundreds of corpses, all of whom now have a craving for human brains. The laughs come early in Return of the Living Dead; when the cadaver (Terence Houlihan) that's hanging in the warehouse freezer is reanimated, Burt, Frank, and Freddy do their best to kill it, leading to a hilariously violent confrontation. Soon, others are involved in the chaos as well, including a group of Freddy’s friends, punk rockers who swing by the warehouse to check up on their pal, then go across the street and hang out at the cemetery (which is where they are when the toxic rain brings the dead back to life). Most notable among the young performers playing Freddy’s chums is future scream queen Linnea Quigley, whose character, Trash, strips down to her birthday suit early on, then spends the rest of the movie buck naked and running for her life! Though it does have its share of creepy creatures (chief among them the “Tarman”, a zombie brought to “life” by puppeteer Allan Trautman, which roams the warehouse basement) and a violent scene or two (like the rather messy demise of a couple of paramedics, played by Drew Deighan and James Dalasandro), Return of the Living Dead clearly favors laughs over scares. Yet its standing as one of the finest horror comedies ever made is certainly well-deserved, making it a movie every horror aficionado should have in their collection. I finally got around to watching this one. It's so goofy and smart - proof of what can be done on a low budget. A classic that still holds up today. I also enjoyed the sequel. I love this movie. Pure fun. But what carries it through are almost all of the performances, especially that of James Karen and Clu Gallagher.